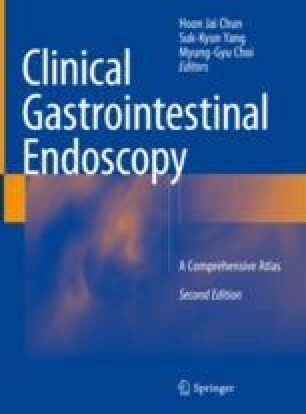 Most subepithelial tumors of the stomach are found incidentally at upper endoscopy and may arise from any of the layers of the stomach. Subepithelial tumors are evaluated for size, consistency, color, and shape by conventional endoscopy. The most common of these is the gastrointestinal stromal tumor (GIST), which is potentially malignant. GISTs are usually firm and immobile. Carcinoid tumor appears as slightly yellow, sessile, or semipedunculated lesions with normal-appearing overlying mucosa. Lipomas are often yellowish and compress like a pillow with a forceps. Pancreatic rests are often antral and may have a central umbilication. If the cause of the lesion is not evident at conventional endoscopy, it should be evaluated with endoscopic ultrasonography (EUS), which can determine the size and the layer of origin. Histology is the confirmative method to differentiate between the different types of subepithelial lesions.